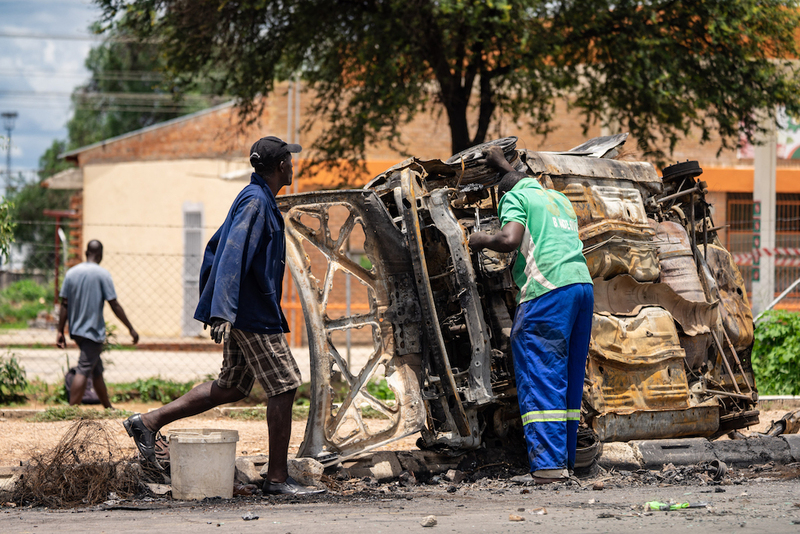 Scrap metal collectors salvages sellable parts from a car shell burnt during the protests in Emakhandeni township, Bulawayo. HARARE – Public sector unions gave Zimbabwe’s government a 48-hour ultimatum to make a new salary offer or face a strike after wage negotiations reached a deadlock, raising the prospect of more unrest following this month’s violent protests. President Emmerson Mnangagwa is under pressure to deliver on pre-election promises to revive an economy wrecked during his predecessor Robert Mugabe, who ruled for 37 years before being forced to resign after a coup in 2017. The Apex Council, which groups 16 civil service unions, said government negotiators did not bring a new offer at a meeting on Monday. More talks are set for Wednesday, Apex Council secretary David Dzatsungwa told reporters after a four-hour hour meeting. “The Apex council gives the government up to the meeting of Wednesday 30 January 2019 or face inevitable job action,” Dzatsunga. But security forces dispersed demonstrations by force and cracked down on activists, leading to fears that Mnangagwa’s government is reverting to the strong-arm politics seen during Mugabe’s rule.